To try to help some natives place this in perspective, and the vehement hobbyist deniers or passive dismissive others: Replace the references, and the message is the same and its the same people doing the indigenous or cultural misappropriation. From the article, “Why I Can’t Stand White Belly Dancers” by Randa Jarrar. “(European Indian hobbyists) confronted have said, “But I have been dancing for 15 years! This is something I have built a huge community on.” These (European Indian hobbyists) are more interested in their investment in (Native American Indian) dancing (singing/drumming/lifestyle) than in questioning and examining how their appropriation…causes others harm. To them, I can only say, I’m sure there are people who have been unwittingly racist for 15 years. It’s not too late. Find another form of self-expression. 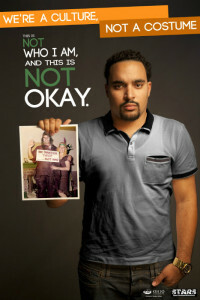 Make sure you’re not appropriating someone else’s. When I have argued, online and in person, with (European Indian hobbyists), they have assured me that they learned to dance from (natives). This is supposed to make the transaction OK. Instead, I point out that all this means is that it is perfectly all right with these (native) teachers that their financial well-being (or ego) is based on self-exploitation. As a follow-up, (European Indian hobbyists) then focus on the…community aspect of (Native American Indian dancing/drumming/singing/lifestyles). Here, the argument ignores the long history of (European Indian hobbyist) appropriation of (native dancing, etc.) and becomes that this: the learning and performance of (native cultures), is not about race and appropriation. Posted in Activism, Culture, Germany, Native American. Tagged cultural ignorance, cultural misappropriation, culturally offensive, european indian hobbyists, german indian hobbyists, native american in europe, native american misappropriation in Europe.